Army Corps of Engineers work in Jackson Park may require Wooded Island to be closed for five years while new plants get established. All photos DNAinfo/Sam Cholke. HYDE PARK — Wooded Island could be off-limits for up to five years because of a quirk in the contractors' work order for the $8.1 million restoration of Jackson Park by the Army Corps of Engineers. Chain-link fences have gone up around Wooded Island in the last week and the sounds of groaning pumps again fill Jackson Park as the Army Corps prepares to reshape the shoreline of the lagoon. 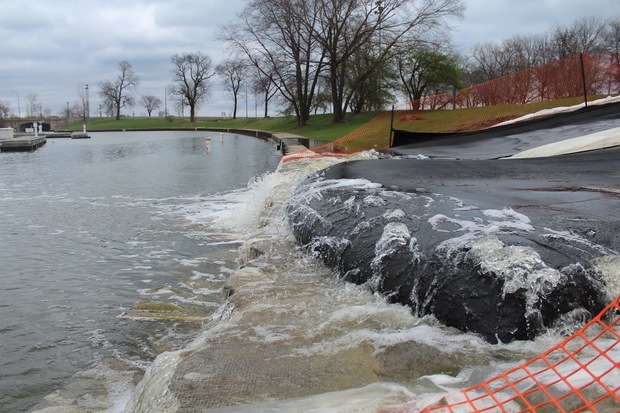 “They could have the site off-limits for five years, but they really have a desire to have it open to the public,” said Kirston Buczak, the project manager in Jackson Park for the Army Corps. She said the contractors’ performance is partially graded on how well the new plants do. She said the Army Corps and all contractors are looking at ways to allow the public onto the island while protecting the new growth. Three massive pumps have emptied much of the lagoon already, revealing scraps of old buildings and what may be a car lurking in the deeper recesses of the lagoon as the crews try to finish planting before spring ends. 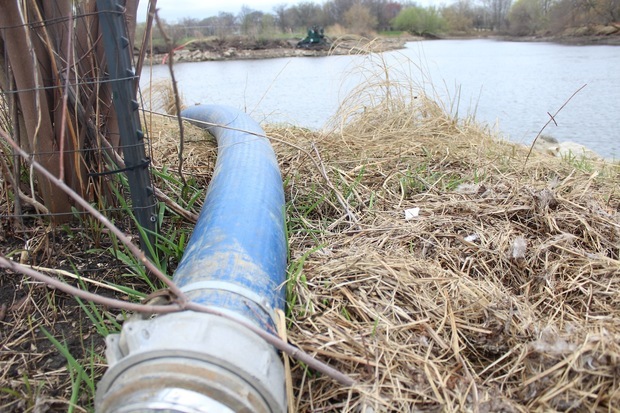 “After the planting is done, they’re going to turn off the pumps and let the lagoon refill,” Buczak said. She said the lagoon’s water level will be kept low over the summer as the new plants get established. “By fall, we’ll have the pumps off for good,” Buczak said. Crews have already finished using a targeted poison to clear the lagoon of carp and other invasive fish. In late spring, the lagoon will be restocked with crappies, brown bullheads, newts and mussels. Fishermen hoping to cast a line from Wooded Island may have to wait though. Buczak said all major construction on the $8.1 million restoration of the park would be complete by the fall. The hose for a pump runs past a bird's nest on an island previously inaccessible until the water level was lowered. 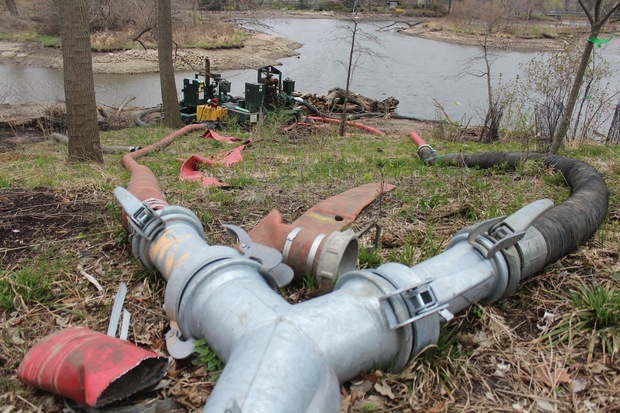 Pumps are keeping the water levels low in the Jackson Park lagoon while Army Corps of Engineers crews reshape the shoreline and puts in new plants.